Heritage Assisted Living - World-Class Assisted Living In New Jersey. Contact Us Today! We are committed to ensuring quality in all aspects of our residents' lives, from fine dining to tender loving care. Learn more about our passion for assisted living! We offer a variety of unique services and amenities at Heritage Assisted Living, including a wellness center and great scheduled outings. Click here to see more. Legacy Place is a special part of our community where we provide enhanced support services for people with dementia and related disorders. Click here to learn more. Interested or thinking about Heritage Assisted Living for you or your loved one? Our team is here to help you in New Jersey. Click here to contact us today! 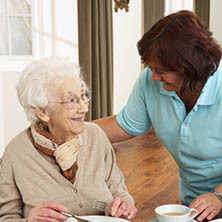 The Heritage meets the individual needs of residents with a full range of assisted living services. Residents select from a variety of room layouts including a one-bedroom apartment. Opportunities for friendship and abundant activities promise a true sense of community. We believe that peace of mind goes a long way toward enhancing lifestyle.